Onyx came into my life January 7, 2000. But the story begins four months earlier. 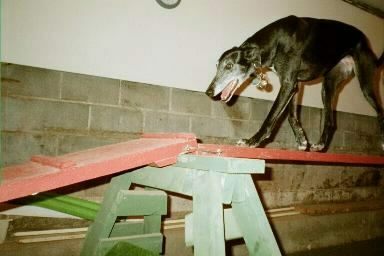 Onyx had the misfortune of not working out in her former home and was returned to the Nittany Greyhound Kennels in September of 1999. Being a petite, young female, she really shouldn’t have had a problem getting adopted again. She had after all mastered Housemanners 101. But maybe there was something to this thing about black dogs and people not liking them. Miz Black Onyx was not getting adopted. The people at the kennel loved her; she had the biggest smile. At the same time, a gentleman deeply involved with Greyhounds, told me about this cute little black girl with the greyt big smile in the Nittany kennels. I was confused why he even told me about her for I was involved with another group. I had two fairly young, healthy girls of my own. And I was not looking for a third Greyhound. Tragedy struck my home in December of 1999 when I lost my very beloved 5-year-old girl, Topaz, to liver disease. I was devastated. So when, within weeks, I started asking around for available dogs, my brain told me I was looking for a 2nd dog, but my heart was looking for my departed heart hound. Well on one of these quests, I asked this gentleman if he knew of any girl that had a smile. I needed something that Topaz had, and she had been a smiler. He instantly reminded me of Onyx. I thought about it for a while. She smiled, I was told about her even though I wasn’t interested, she has been waiting in the kennel since September even though she should have been an easy adoption, and her name was that of a gemstone, just like Topaz. Karma I said to myself. She was meant to be mine. So I pick up Onyx in January. But I really wasn’t ready. She may have smiled like Topaz. She may have had a gemstone name like Topaz, all signs of fate screamed that she was my next one. But the heart was still broken. You can’t open up the door to the heart if the hinges are busted. And so Onyx started her new life in a home that was nice, and warm, with big a back yard, doggie door, great food, a companion Greyhound and a kind human. But there was no love. Bonding was non existent. I likened her personality to that of an eggplant as she dealt with this loveless environment by just existing herself. By March, I decided that I needed to do something to force me to bond with her, so I enrolled her in obedience class. She was very obedient, mind you, never got into trouble at all. But I was doing this for the bonding. 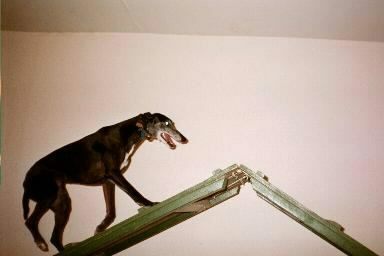 Something that she and I could do together without Brindle, my other Greyhound. When we first entered the training room, her tail was tucked all the way up. She shook so hard the floor vibrated. But she still smiled. We started work on the obedience commands. This trainer doesn’t push for Greyhounds to sit. But I told her I have seen Onyx sit naturally. So we tried a method to make her sit on command. She screamed so loud the rest of the class looked at us as if we have just broken her leg. But it was fear, so we nixed the sitting. As each week progressed she began to relax, eventually enjoying the classes. She learned she got treats if she did something correctly. Nothing was mastered but most everything got accomplished. She would “down” on command, but not instantly. She heeled very nicely, but sit, forget it, we scared her. After the six-week course, she was starting to listen to me and to enjoy the outings we were having. But, she still would not sleep in the bedroom with Brindle and me. She would not play with toys. She was still the household eggplant. By April I had Brindle in the intermediate agility class. During one class I asked if I could try Onyx on some basic agility to see if she might be interested. The simplest obstacle to try was the tunnel which when fully collapsed, is only about two feet long. She shook so hard from fear that I thought she was going to shake the pictures off the wall. Having no reason to be so afraid we coaxed and pushed her through the itty-bitty tunnel. She got a treat and praise. Oh, the joy of mastering that obstacle. 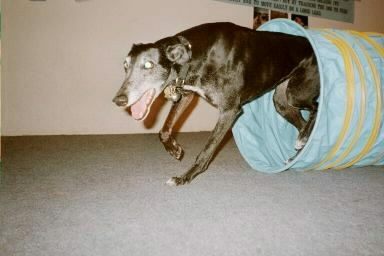 She was so happy; she just bounced, smiled, and twirled that Greyhound twirl. We decided to repeat that exercise. Her tail was still between her legs, she still trembled a bit, but no pictures fell off the wall. It didn’t take as long this time around, and she was just as happy when she conquered it. Once again we did it and she went right through. One more time and she did it like a pro. The instructor and I looked at each other and we said, “mmmmmaybe”. We really won’t know if she can do it or not until we try. She was very fearful the first time. But was ecstatic when she succeeded. Brindle was hospitalized for almost 3 weeks in the summer and Onyx got some very needed one-on-one. For the first time she got to be on the couch where Brindle usually laid. Onyx had always been invited onto the couch, but she never joined us. For the first time Onyx also had a chance to sleep on the bed with me as well. It was during this period that she started to realize that she had the whole acre back yard to herself to run around in and started daily runs all by herself. I would watch her from a window or front yard and enjoy the sight. But she still didn’t play with me, nor did she come into the bedroom once Brindle returned. My little eggplant was aloof but starting to blossom. August came and it was time for her agility. As we entered the same room we had obedience she instantly recognized her instructor. Onyx gave her the biggest smile she could muster. With each obstacle she was introduced to, she showed less fear and apprehension. A big obstacle was the sit, which we never mastered in obedience. She needed to be able to sit on a table to the count of 5. So at home, we diligently worked on getting Onyx to learn how to sit. One particular session back at agility, while the instructor was working on another dog having problems, I took Onyx aside and asked her to sit on the rug holding the treat in my hand. It took a while, but she got the message. After several repetitions, we went to the hard table and worked on it there. By the end of the night we were getting instant sits on the hard table. Now came the biggest obstacle for large dogs, the “dog walk”. Onyx, up to this point had been doing very well, but still had timidity issues. The rest of the class consisted of very large dogs except for a Jack Russell. That dog did the “dog walk” first with no difficulties because she was so small. But to larger dogs such as the German Shepherd, Bernese Mountain and Akita, the six-inch wide dog walk was a scary tightrope. The instructor worked closely and carefully with each dog. Expecting Onyx to have a lot of trouble, we were last. Since she was not big, just tall and skinny, when our turn finally came, I got up confidently, told Onyx “dog walk” and proceeded to introduce her to the long narrow walk. She went up, over, and down without a blink, hesitation, or quiver. Ta da! She has mastered all the obstacles and the instant sit and down. We were so successful in the beginner class, we advanced to the next level. In Intermediate Agility, we worked on more complex obedience where I commanded her at a distance away from the obstacle she was to perform. She still needed to work on her stays and her enthusiasm, though. She got so excited she started running around, smiling, trying to figure out where to go. She hit the table with such speed she slid off. But that improved as well. With successful agility classes behind us, she had finally come into her own. She slept in the bedroom at night taking turns with Brindle on the bed with me. She had started doing a version of “Timmy’s in the well”, a routine copied from the old Lassie series where she grabbed my hand and lead me around back yard. She also incorporated a play session with me grabbing one of my old garden gloves, whose partner I mowed to ribbons. She ran around the yard teasing me, enticing me to chase her. She had also discovered the joys of lure coursing and excelled at it. Onyx was introduced to the ocean at the Dewey Beach Greyhound weekend later that year. She was fascinated by it and started to chase the waves. She got a little too close to the water and was overwhelmed by a wave. Nonplussed and soaking wet, she continued to chase the waves. Of course, I got wet trying to keep up with her. It took a year of work on both our parts for her to come out of her shell and for my broken heart to start mending. But she turned into quite the playful Greyhound. She was no longer my eggplant. She has blossomed into my little socialite. Aww bless, onyx sounds sooo sweet. It’s taken me 18 months to be able (emotionally) to get another greyhound after losing my gorgeous girl at the age of 14… but our small terrier, who grew up with a greyhound, needs canine company so we took the plunge and rescued this one from the local racing kennels. Like my girl, he’s black with white, I’d always vowed I’d get anything but black and white, as I felt it would be somehow disloyal to her memory, but here he is and it feels ok. That’s the difference, he’s a boy, aged 2 and much bigger than my girl. I like to believe she’s still with us in spirit and I’ve told her about Harry and asked her to help him settle in. Here’s to a long and equally happy relationship. this story brought tears to my eyes as I read it, while petting my baby greyhound.